Plug and Play Access to Awesome AKG Sound! A new direction for a microphone legend! The Perception 120 USB is the first-ever USB microphone, from a company with a long and storied history of making some of the best microphones in the business. And the microphone the Perception 120 USB stems from — the Perception 120 — has a following of its own, widely recognized as one of the best bang-for-your buck microphones for capturing vocals (or even loud instruments, thanks to its high tolerance for loud sound sources). If your budget affords you just one really good microphone for do-it-all recording, and you're hoping for plug-and-play USB convenience, this is it. This mic is ideal for podcasters, voiceover talent, and anyone who wants to capture a rehearsal or meeting without the fuss. To tip the AKG Perception 120 USB microphone into all-star value, AKG added accessories you'll appreciate. There's a tripod table stand and a swivel mount, so you can get your microphone in the perfect position on your desktop. And the USB cable comes with it, so you can plug into your Mac or PC and get going straight away. For good measure, AKG also gave the Perception 120 USB a switchable bass-cut filter, so you can keep wind noise or other strange rumbling out of your recordings. And you can use the switchable pad when you need to get this microphone up close to loud instruments. Equipped with everything you need, and ready when you need it — that's the AKG Perception 120 USB! 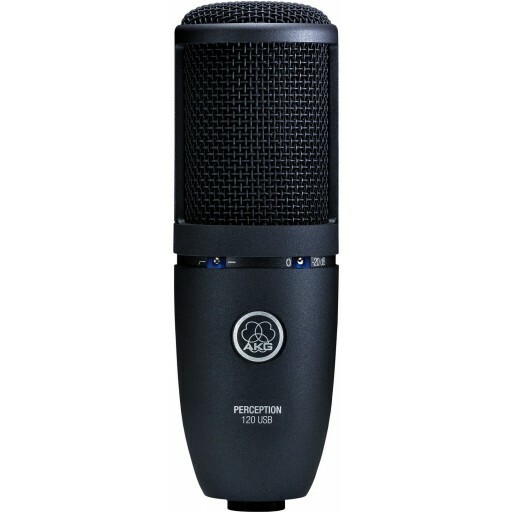 The Perception 120 makes it easier than ever to get that AKG sound quality into your recordings!